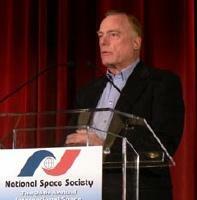 SpaceDev announced today that its founder, Jim Benson, passed away this morning. Benson had been in ill health since last year, having been diagnosed with a brain tumor that was the cause of his death. That illness led to the dissolution of Benson Space Company, a space tourism venture that Benson founded in 2006 to develop suborbital vehicles, by early this year. Benson, though, is best known in the space industry as the founder of SpaceDev in 1997. Benson was originally interested in developing a private mission to a near Earth asteroid (called Near Earth Asteroid Prospector, or NEAP). Over time, though, the company moved from that focus to developing smallsats, launch vehicles, and hybrid propulsion systems. That latter work led to the deal with Scaled Composites to manufacture the rocket motors used by SpaceShipOne in its successful bid to win the $10-million Ansari X Prize. Along the way, though, it’s safe to say that Benson rubbed a few people the wrong way. In public settings, he was a shameless self-promoter and often blunt spoken, traits unlikely to win you Mr. Congeniality in any field. His best-known dispute was with Burt Rutan after the X Prize was won, a dispute so heated that it warranted a front page story in the Wall Street Journal in early 2007. It’s ironic, then, that two months ago a post-Benson SpaceDev signed a deal with Scaled to work on the rocket motors for SpaceShipTwo. While Benson may no longer be with us, the company he created, SpaceDev, continues to make progress on some of the same goals of commercializing space that Benson had when he created the company. Earlier this week SpaceDev announced it had achieved another milestone in its unfunded COTS Space Act agreement with NASA regarding its Dream Chaser vehicle that, launched atop an Atlas 5, could carry cargo or crew to the ISS. Rest in peace, Benson. You will be missed. I met Jim because of his mother 3 years later after his death, Linnet was very upset the night i met her. I found her in midnight in the middle of street crying because she couldnt sleep and, most impornt, because she missed Jim. She ask me to find something in the internet – Go Google y write Jim Benson Dies – She said. It Was a very strange night and not well describe by me in this post. I only know you never know what’s comming in life. I think Jim was a very intelligent person and he had a very lovely mom. I met her when she was 86 in Mérida, México.